Imagine a small group — in Whitney Balliett’s words, “flesible, wasteless,” that successfully evokes the best jazz of the Swing Era without copying recorded performances, that is fresh, witty, precise. Need an anlalogue? 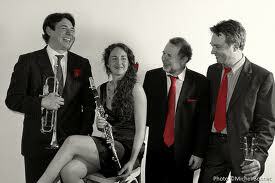 How about Glenn Miller’s Uptown Hall Gang with arrangements and originals by Mel Powell? 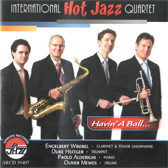 This group exists, and they’ve made their first CD — consistently splendid music. A few of my readers complain that my musical endorsements are nudging them towards ruin, but LES SWINGBERRIES are worth it. About thirteen months ago, I wrote happily about this group — propelled by their 2011 YouTube videos: click here for that post. I’ve been fortunate enough to exchange a few sentences with Mlle. Tropez at the International Jazz Festival at Whitley Bay — where she was not only a charter member of Les Red Hot Reedwarmers but also played some memorable casual swing duets with pianist Paul Asaro. And Monsier Montier I met for the first time (I hope there will be others) as a wonderfully agile tenor saxophonist at last year’s Sacramento Music Festival. It came as a huge shock to find out that he is the immensely gifted guitarist in this group, not only echoing Charlie Christian but also Tiny Grimes and a host of other fine players. The answer, dear readers, is only a few clicks away. Les Swingberries have issued their first CD, which is called LAUGHING AT LIFE — not only a song they play but an indication of their buoyant spirits. The thirteen selections on the disc are varied and lively — two Mary Lou Williams compositions, CLOUDY and GHOST OF LOVE; Leonard Feather’s SCRAM! Three other themes are “classics” by Strauss, Tschaikovsky, and Offenbach — initially, I thought of the John Kirby Sextet, but then the heretical whisper came into my mind, “This is better than the Kirby Sextet ever did,” because of a light-hearted rhythmic looseness owing something more to Wilson and Waller than to Kirby. The group seems to float, and the performances seem too brief (although they are between three and five minutes). The arrangements are beautifully subtle; on a second or third listening, I found myself marveling at the writing for two horns that suggested a larger ensemble; the fact that a rhythm section of piano and guitar never seemed thin or under-furnished. Both CLOUDY and GHOST OF LOVE are lovely mobile mood pieces with inspired playing by each member of the quartet. LAUGHING AT LIFE has equally hip writing / voicing / harmonized lines that suggest an unissued Keynote Records session tenderly waiting for a twenty-first century jazz archaeologist to uncover it for us. The group lights up BLUE ROOM and HALLELUJAH! from within; the remaining four performances are originals — one a funny tribute to Rex Stewart, REXPIRATION (where the rhythm section gets some of the waiting-for-Benny feeling of Christian and Johnny Guarnieri, always a good thing). SCHNECK IT OUT has surprising harmonies yet a walking-down-the-street feeling I associate with YACHT CLUB SWING. BERRY CRUMBLE is built on BACK HOME AGAIN IN INDIANA, but in such a sly way that it would take any listener two or three minutes to uncover those familiar harmonies. 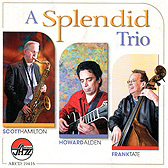 Listening to this CD, I never had the feeling of surfeit that many CDs produce (“Oh, this has been wonderful . . . but eight more tracks?”) — it is a subtle, enriching musical experience, and a lot of fun. I have some trepidation about delivering my readers into the Land of Downloads, but here is the link to the iTunes site — where one can purchase a song for 0.99 or the whole CD for 10.99. Or, if you prefer your music delivered by the Amazon conglomerate, here is their link.